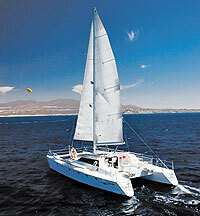 Charter the most luxurious catamaran in Cabo San Lucas for your group! Sail with the wind, enjoy snorkeling, whale watching, a sunset cruise, or whatever your heart desires. Stop in isolated bays, snorkel in sheltered coves, get amazing photographs of Land's End and the Arch, sip cocktails and soak up the warm Cabo sunshine. Manta can comfortably take up to 50 passengers plus her first-class crew. If you have a large group in town for a wedding, family reunion, corporate retreat, or any other event, treat them to a fantastic day or evening on the blue waters of the Sea of Cortez. This is a private charter, so just your group will be on the boat, and we can customize it in any way you like! Bask in the warm Cabo San Lucas sunshine as you sail with the wind past Land's End, along the Los Cabos coastline, and snorkel in the clear waters of the Sea of Cortez. Sip cocktails from the unlimited open bar, feel the wind in your hair and the unique feeling of the lapping waves on the twin-hull catamaran. Enjoy delicious lunch and first-class service, all set to the perfect choice of background music. Of course, this is a private charter so the itinerary is always full flexible to fit your group's interests! Includes: English-Speaking Crew, Buffet Lunch, National Open Bar, Snorkeling Equipment, Towel Service. Schedule: Flexible to fit your schedule. We suggest a 11:00 AM start time. Gracefully sailing past the famous landmarks of Cabo San Lucas, including Land's End and The Arch, on a luxurious private catamaran, sipping cocktails together as the sun melts into the Pacific Ocean, casting a brilliant array of colors into the sky...sounds like a dream, but it is at your fingertips! A lovely treat for your group, no matter the occasion. Includes: English-Speaking Crew, Buffet Dinner, National Open Bar. Schedule: Flexible to fit your schedule. We suggest a 6:00 PM start time in summer and 5:00 PM in winter.